to efficiently get you around Columbia. 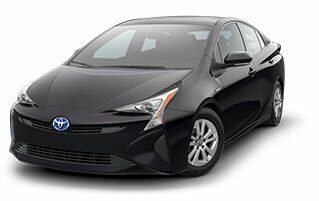 Complimentary with your next 2017 Prius is our Family Plan worth over $3,000! The more you drive, the more you save with lifetime oil changes, lifetime powertrain warranty, lifetime car washes & even more. Standard with every 2017 Prius is the Toyota Safety Sense (™) P which combines the Pre-Collision System with Pedestrian Detection & Lane Departure Alert with Steering Assist. You will drive in style & safety in North Carolina. Your next Prius comes standard with smart-flow climate control integrated with pollen filtration. Plus, with the Entune (™) audio package, you receive 6.1-inch touch-screen display, six speakers, advanced voice recognition, hands-free phone capability plus so much more. The 2017 Prius offers up to 27.4 cubic feet of cargo space with 60/40 rear seats expanding your cargo space up to 65.5 cubic feet! Combined with 54 MPG City, your roadtrip options are endless & efficient.